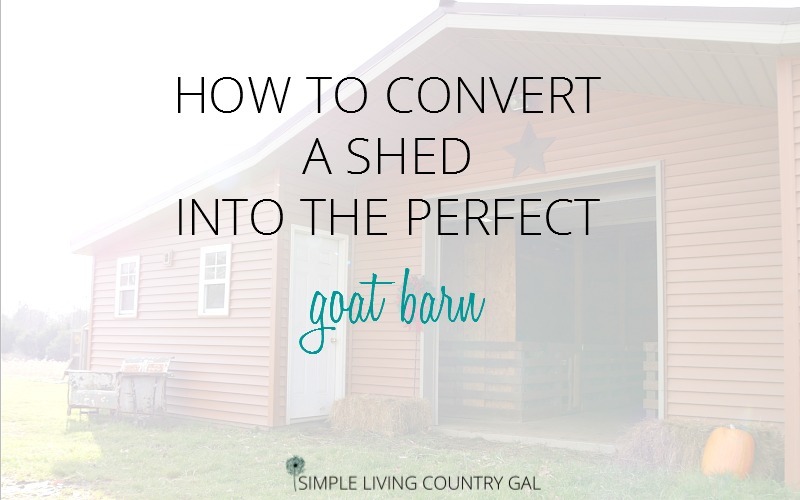 When folks ask me about getting started with goats the first question that comes up is “Do I need a barn to raise goats?” While a goat barn would be ideal, it is not necessary. The main goal when housing any type of animal is to protect them from the elements. This will obviously be different depending on where you live. Whether it be from the rain, cold, wind or heat of the sun. All animals need a place to go that is always warm and dry. If you are in a warmer climate area, then a lean too (or a shelter with only 3 sides) will probably be enough to keep them housed. If however, you live in a colder climate area such as Northwestern Pennsylvania like I do, then you will need a bit more. We actually do not have a barn so much as we have a shed that we converted into a barn. The nicest part is this barn is specifically built to house goats. 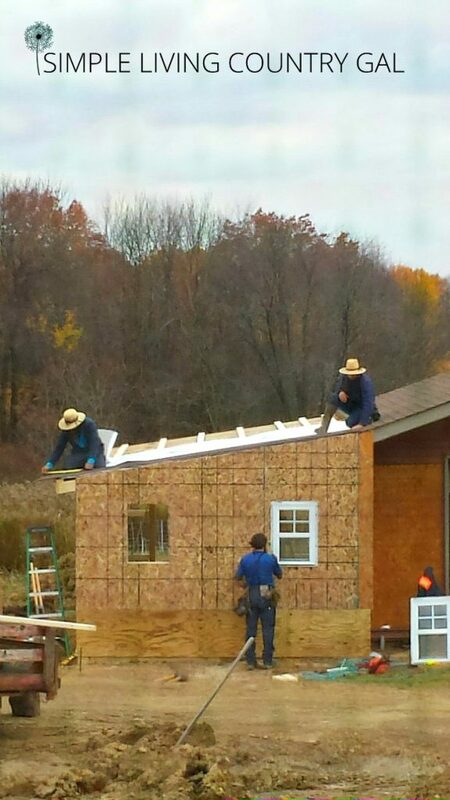 Let me just jump in here quick and let you know that building a barn is expensive. Really REALLY expensive. Right before we were ready to break ground we were hit with a few financial bullets. (for us this is a pretty much how it goes) We had to stop and rethink things pretty quick. After taking a walk one Sunday afternoon, Hubs pointed to our large shed and suggested we instead just convert it into our barn. This would save us quite a bit of time and a crazy amount of money. Yes it was close to the house and nowhere near where we wanted the barn to go, but we knew this was our only option so it was shed or nothing. We decided to go ahead with this plan B and today I can safely say is was the best decision we ever made. When Hubs and I designed our shed to barn project we knew we wanted to raise goats and pigs with goats being our main focus. Once you know exactly WHAT you want to raise the HOW is a bit easier. After a little (well quite a lot actually) of research, we found a few things held true. 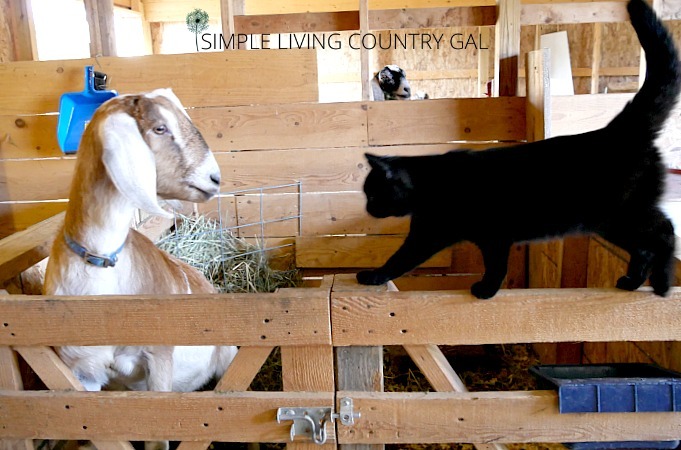 Goats need room to move around and you should have a place to house sick or birthing goats. If you plan to mainly (or only) raise and breed goats this set up I have found is the best most efficient way to do it. Before we begin you will want to determine just what you need so you can see if it will work in what you have. Let’s call this our wish list. A list of the perfect goat raising set up. These are not required but the more you can check off the easier it will be to raise your herd. 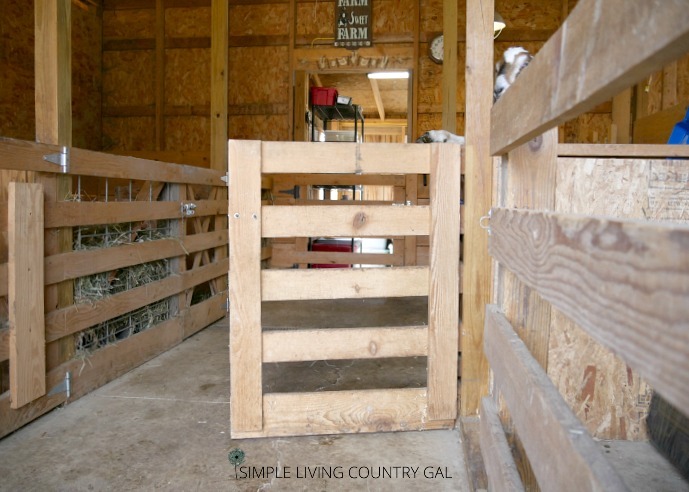 Characteristics of the perfect goat barn. I like to have a large open area to house my herd as a group. This encourages the goats to get along or at the very list establish the hierarchy. Or the pecking order. You want to make sure they have room to move and are not overcrowded at all. This is even more important in the winter when your animals will be closed up. Give them the option to huddle together if needed but still have room to move around. We added on two communal sections to the sides of our shed. They are each 14′ x 24′ and can easily house up to 6-8 goats on each side. Having 2 communal areas is nice but not necessary. I prefer it to help regulate breeding’s (since I have 2 bucks) and I can keep younger doelings together as I wait for them to join the main herd. Another convenient but not necessary part of a goat barn is a place to house your sick goats or does that are in labor. Since I am new to raising goats (just 8 years now) I like to have my does separate when they are kidding. This gives them privacy and gives me a better chance to observe and intervene if necessary. Sickbays are also nice to have if you have a goat that is being picked on and you want to just get them away so they can catch their breath a bit before going back in. Since I am breeding right now, my poor wether (a castrated goat), Peanut, was getting beat up by the does and the buck. Since I have a place to keep him I am able to safely pull him out of the herd and house him while the herd is breeding. Once done he can go back in and everyone should be calm and a bit more friendly by then. When you have a sick goat for any reason it is important to get them out and separate. This will keep any sickness from spreading and give you a more hands-on environment. Medicating a sick goat is much easier in a small pen rather than a big open area. Our main shed is where we set up our pens. Since this has a concrete flooring it is much easier to keep neat and clean. I have 5 pens set up that I can easily remove and add sections to make them either larger or smaller depending on what I need them for. Make sure to reinforce your pens to keep your goats in. Corner braces work perfectly for this. Along with sturdy gates that can withstand the weight of a curious goat. Tip: When creating your set up it is best to make things adjustable. I learned early on what I thought would work didn’t and I needed to change things up. Setups need to work not only for your animals but for you as well. Be open to changing things (more than once) until you find what works best. Have a place specifically meant for milking. Having a stall or at the very least a separate area is ideal when you are milking your goats. Keeping things neat and tidy in a milking stall is important for fresh and clean milk so an area set up specifically for milking is high on your priority list. Most barns I toured had separate milk houses, but our budget just could not handle that. Instead, we use a corner stall. This stall is close to the main area yet far enough away that I can milk with little distractions. Have sufficient space to hold hay and feed. When storing hay be sure you have good air flow. 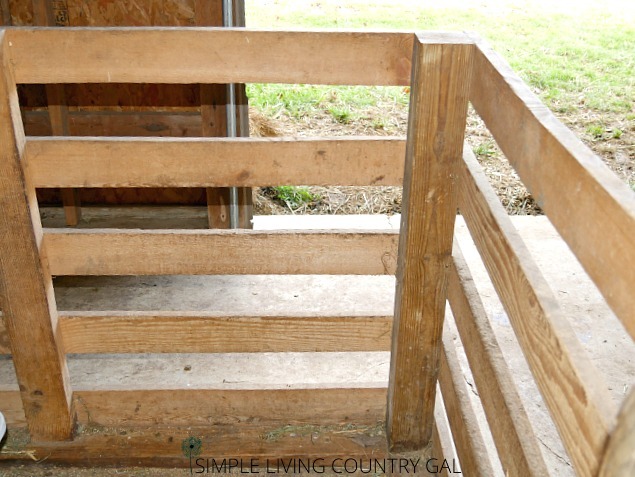 This will keep your hay dry and free from mold. Since our shed has a garage door right next to the hay, we simply keep a large board in front to keep any snow or rain away that may blow in when I open it. Tip: It is extremely important to never give your goats any feed or hay that has mold. This will not only make them sick but could potentially kill them. Keep all feed and hay protected from the weather and dry at all times. In the beginning, we did not have a room set up to hold more than a few bales of hay. That meant we were off to buy hay weekly. This got old pretty quick, especially in the winter. Now we stock up and keep this chore at least down to a minimum. 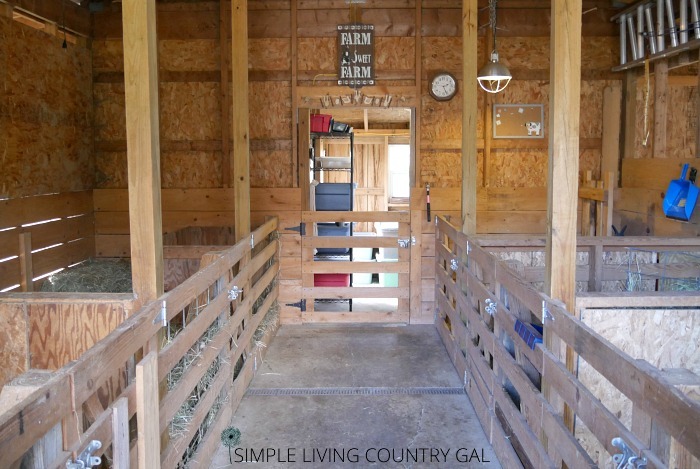 Although not necessary, a feed room is definitely nice to have if you have the room for it. We had a chicken coop on the back of our shed that we converted into our feed room. This keeps all the feed away from the goats and there is plenty of room for medications, herbs, grooming supplies, tools and even my trusty stash of zip ties. I have a pen style gate on the feed room to keep the goats out just in case they get out of the main pen. Tip: ALWAYS be one step ahead of your goats. 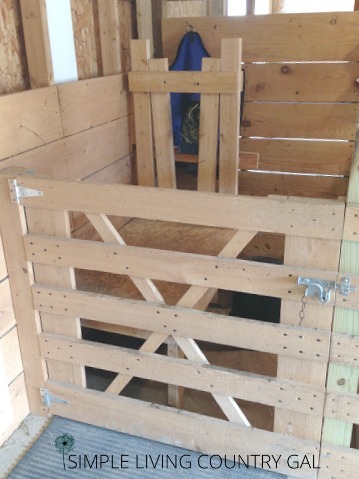 A gate of a feed room is a perfect example. Don’t think your goats won’t escape a pen, because they will. Having a second line of defense keeps my feed room free from my mischievous crew. Once in the feed room, all feed is contained in containers or bins. This is just another step I take to keep rodents, chickens, and goats out of my feed. Have an outside area or access to your pasture. We live in a very wet area so keeping goats here is a bit tricky but not impossible. I learned quite quickly that letting my goats onto a wet pasture is a big No-No. For that reason, we have an enclose small outside section that can be opened up to the main pasture. This gives my goats access to fresh air and sun without being on wet grass. Tip: Slugs and snails on wet grass can give your goats worms quite quickly. If you live in a wet area keep your herd off of pasture until the dew has dried up. This will do a lot to keep your herd worm free. We have a fenced in outside pen that our main pens open up on to. They are approximately 1o’ x 14′ and just enough that they can lay in the sun which they like to do quite often. Keep your barn or shelter facing away from the wind. If you are starting from scratch this tip is extremely important. Make sure your main opening opens away from the wind. This will keep your shelter warmer and the snow from piling up every single day in front of your entryway. Another chore I will do all I can to avoid. Lucky for us our shed already faced the ideal direction. So, other than some drifting shoveling snow is kept for our chicken coop and not the full barn. When you are looking for a place to house your goats keep in mind the distance from your home. Remember you will have to haul feed, possibly water, milking supplies and other items out to do chores. Keeping things closer will definitely be much better. Because when you have animals and you are new to raising those animals you will find yourself checking on them constantly. 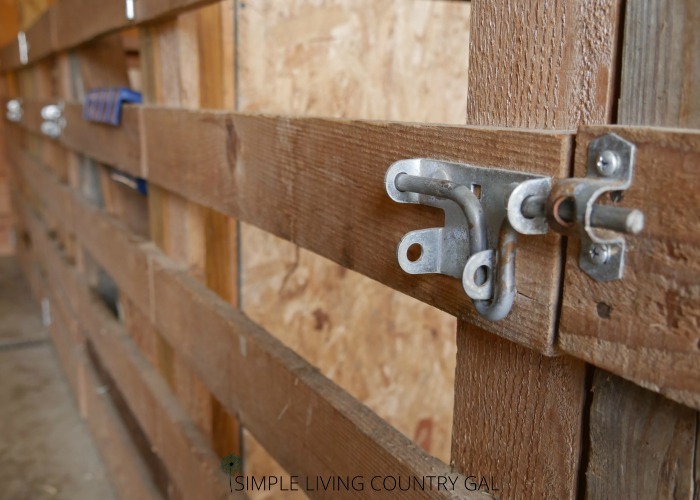 When your barn is just 30 feet from your door, this will make checking on them much easier. Nothing proves this more than when you are in birthing season. I was in my barn every hour on the hour during the coldest months of the year. Thank heavens our barn was close and this wasn’t that big of a bother. But if we had put our barn in it’s original location I would have needed to use the 4-wheeler just to get there more easily in the snow. So keep this in mind when scouting out a location. Tip: If you have goats that are close to kidding and you want to keep a better eye on then, try a baby monitor. It can reach pretty far (most cases much further than a remote camera can) and you can carry your end of the monitor on your belt. You can then listen to your goats and easily tell when you have a goat in labor. Panting, yelling even will be what you hear so you know it is time to get out there. This was a game changer for me. Having that monitor kept me from having to check on my mama’s constantly throughout the day. All in all, our shed to barn project ended up being the perfect solution for us. 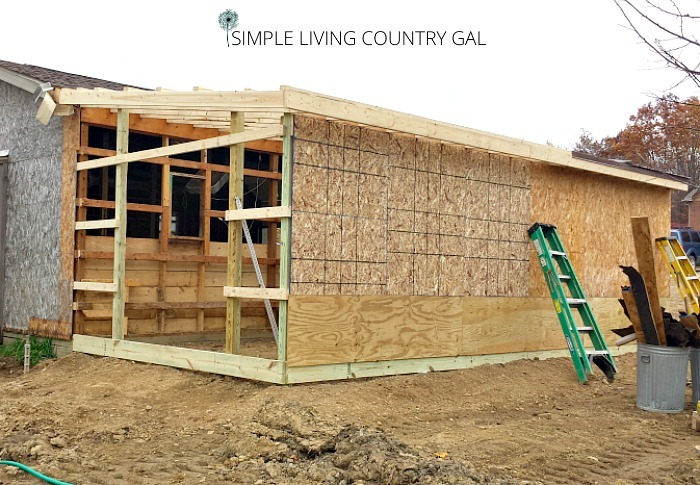 The cost was just a fraction of a full barn construction, the time was days to construct rather than weeks to months and we could still tailor our setup to fit us and our animals the best and most efficient way. When housing your animals keep in mind the climate, the types of animals, their heartiness and finally your financial situation. Finding a solution that will marry all is your main goal. To do this you may need to think outside of the box. Look at your property and what you have to work with. 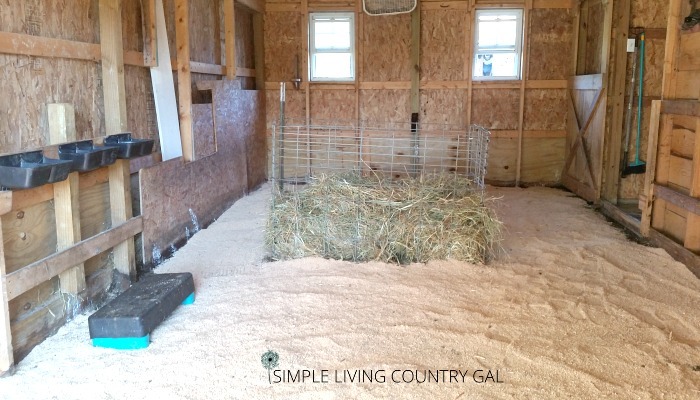 A full barn and even a shed is not a requirement for raising goats. You can use a lean too or convert any building into a pretty amazing and useful shelter. See what you have a try to make it work. Keep them warm, dry and free from the wind and cold and hot direct sun and you will have healthy, happy and productive animals. I just entered the giveaway, and congrats on your first one! (I have still not done a giveaway yet–not sure what exactly to do)! I submitted 2 entries, and I wanted to let you know that when I clicked to make a comment, the page wasn’t valid. So here I am: commenting! Not sure if you remember me: We met briefly at the Activate conference! Have a very awesome day and a beautiful holiday! I sure do remember you, Heidi! Well, I just knew I wouldn’t get through this thing without at least one glitch! I will have to see if everyone else had troubles as well. Thanks! When you are ready to do yours, please let me know! How big was the initial shed? 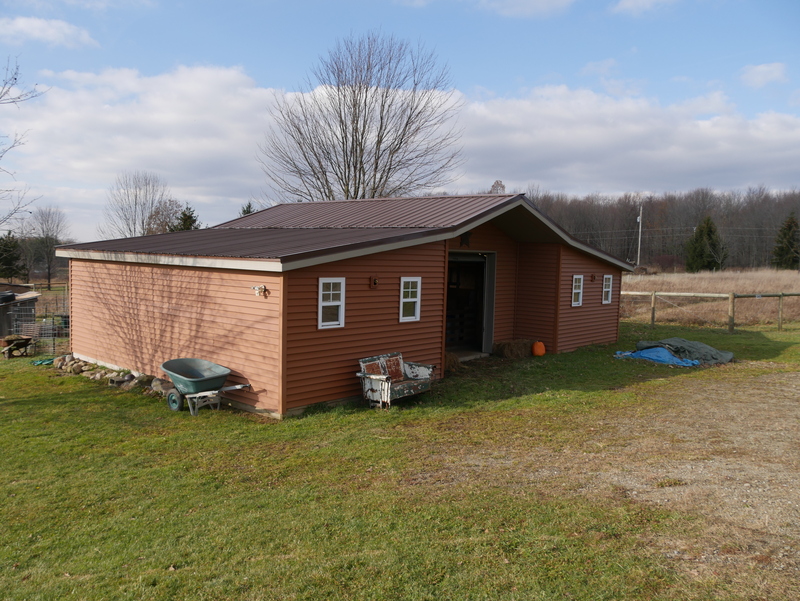 I have a 10’x10′ shed that I want to use as a starting point. I am going to be getting Nigerian Dwarf Goats this Spring and an trying to figure out how to convert it. That shed is large, roughly 20 x 18, but if you only have a few goats then 10 x 10 should work just fine. As long as they have plenty of room to move around in and you are able to keep up with the cleaning you should be good to go. Now, with that being said, if you live in a cold climate where your goats will be more in the shelter than out, you may want to only keep 2 in that shed.